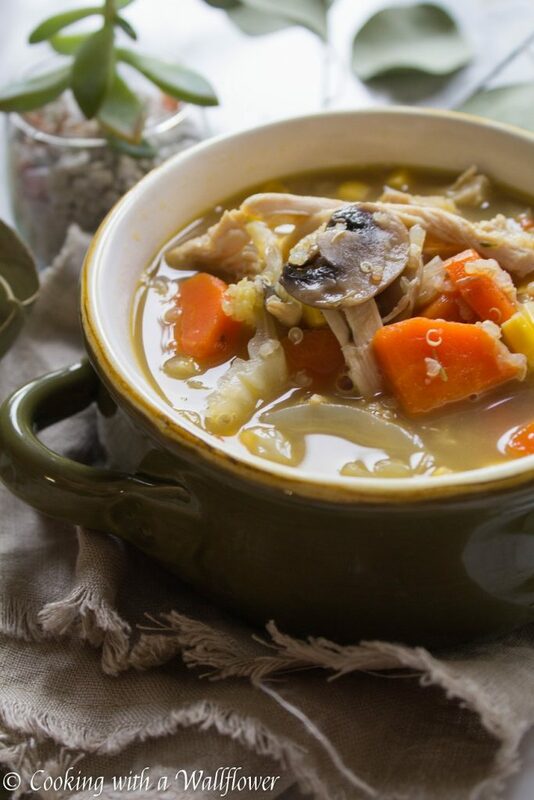 Warm comforting soup filled with shredded chicken, vegetables, and quinoa. This chicken vegetable quinoa soup is perfect for staying warm during the winter. Have I mentioned that I’m not really good with the cold? I sleep with the heater on and under layers of blankets. I leave for work with a puffy jacket, a blanket scarf, and gloves because I can’t handle the cold. I love the idea of snow, but I don’t think I can live in a place that snows. I would never want to leave home during the winter. lol. I don’t know how you guys do it! Since winter is officially here, I need something warm and comforting to keep the cold away. What better way to keep warm than with soup? Honestly, you can add whatever you like. For this soup, I had onions, mushrooms, carrots, garlic, cabbage, and corn. Then I added shredded chicken and quinoa. You can switch out the veggies for whatever you like or have on hand. That’s what I did. 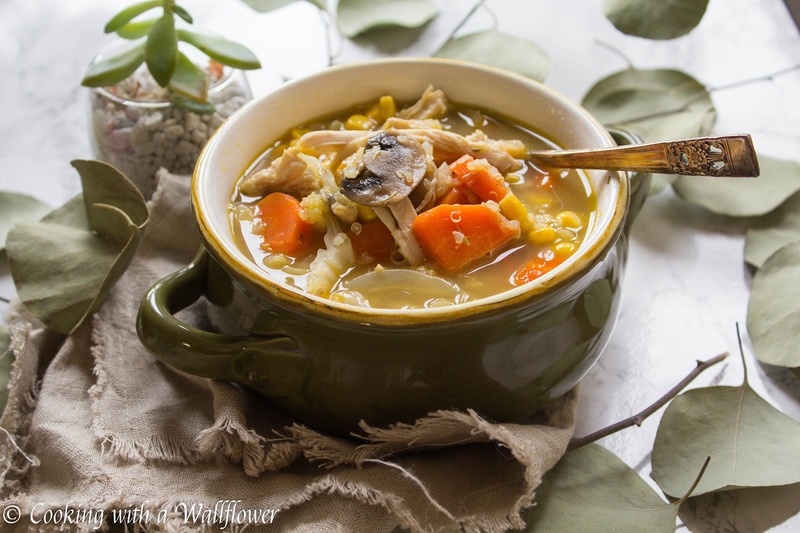 This soup would also be good for when you’re feeling under the weather too. Especially since it’s been so cold lately. In a medium sized pot, add about 2 tablespoons of olive oil over medium heat. Allow the olive oil to heat for about a minute. Once the olive oil is heated, add minced garlic and cook for about a minute until golden brown and aromatic. I love adding garlic to soups and just about anything since it gives an extra boost in flavor. Next, add onions, carrots, and mushrooms. Cook for several minutes until the vegetables are tender. 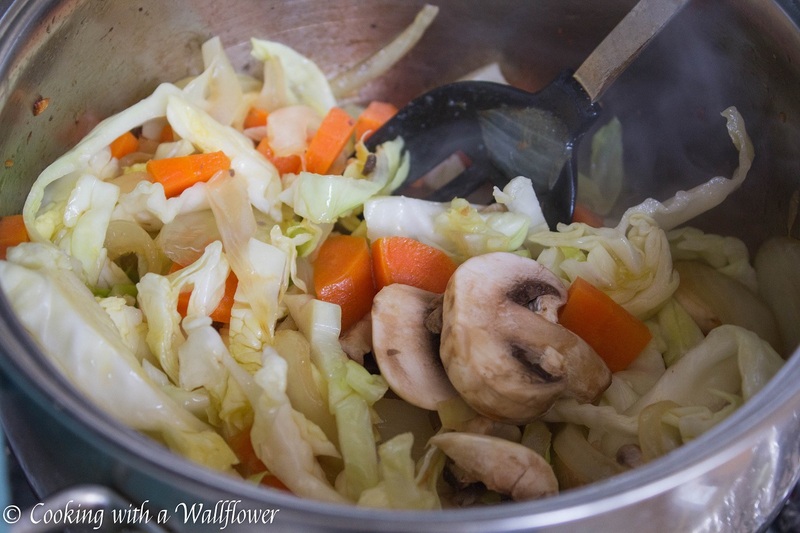 Now, add the chopped cabbage to the pot. Pour in the chicken broth. Season with dried thyme and salt. Then, add the quinoa. 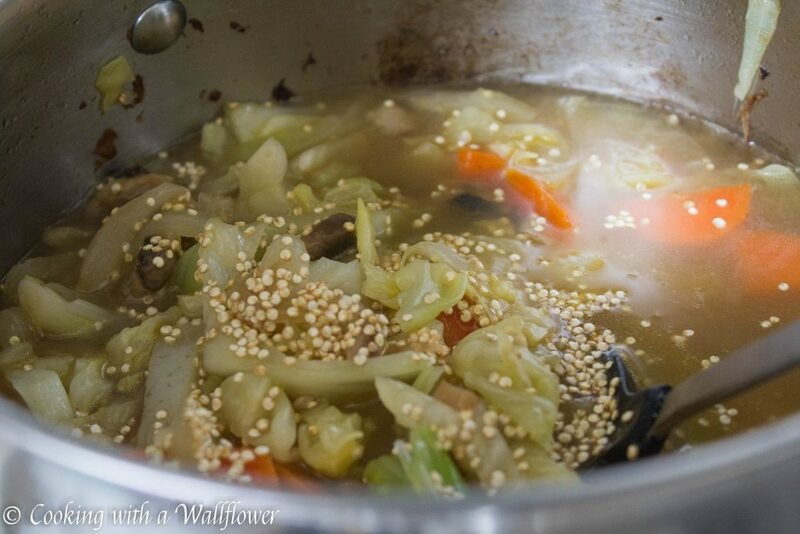 Allow the soup to simmer for about 20 minutes until the quinoa appears fluffy. Then, add the corn kernels and shredded chicken and cook for a few more minutes until all the ingredients are warmed through. The longer the soup is simmering the more flavorful the soup will be. 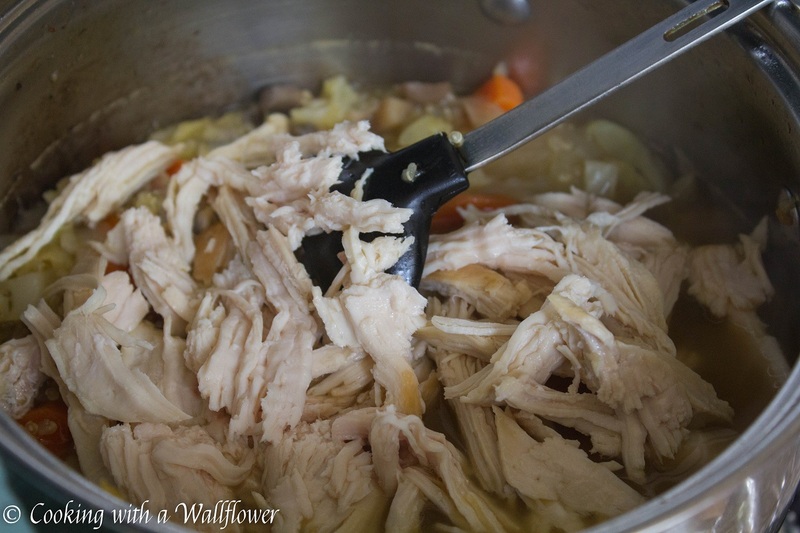 I sometimes like to use leftover rotisserie chicken for soups. But if you don’t have leftover chicken, you can quickly make shredded chicken. I happen to like to cook chicken first and add it at the end so that the chicken doesn’t become overcooked. Add about a tablespoon of olive oil to a medium sized skillet. Allow the olive oil to heat for about a minute over medium low heat. Add the chicken breast to the skillet and cook for 1-2 minutes. Flip the chicken to the other side and cook for another 1-2 minutes. Lower the heat, and cover the skillet. Let the chicken cook for 10 minutes. Turn off the heat but keep the skillet covered for an additional 10 minutes. Remove the lid and let the chicken cool to touch before using forks to shred the chicken. 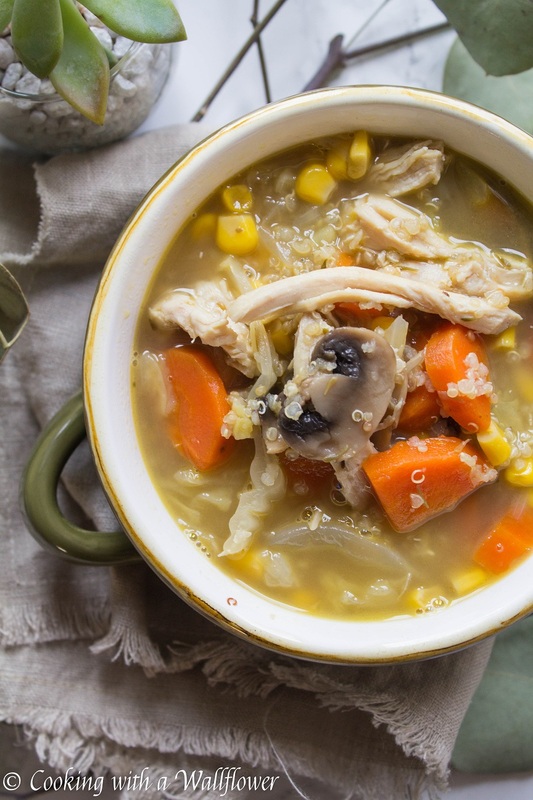 Serve this chicken vegetable quinoa soup warm. Once the olive oil is heated, add minced garlic and cook for about a minute until golden brown and aromatic. **Use leftover rotisserie chicken for the shredded chicken, or to make your own, there are detailed directions in the blog post. 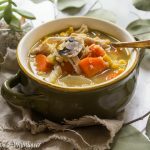 This entry was posted in chicken, Farmer's Market, Gluten Free, Healthy, Quick and Easy, Recipes, Soup, Winter Cravings and tagged farmer's market, gluten free, healthy, quick and easy, soup, winter recipes. Looks very hearty and comforting! Great idea to add quinoa! This looks so good for the body and soul – especially during this time of year! It looks real, except that I don’t like chicken soup. But for anyone who does, I’ll bet it’s amazing! I hate the cold too, so I’ve been making other soups to keep me warm. perfect for this weather!! looks very yum! This looks so delicious, Andrea, especially now when we are in the middle of some brutally cold weather. Thank you so much for liking my site. I am immediately drawn to yours because it is about food. I love to cook and I love to make soups of all kinds. I am the creative type and I generally use whatever I have in my pantry, freezer, or fridge. I’ve followed your site. I want to add that I think it’s amazing! Happy New Year! Looks delicious and tasty, like it will warm you right up! 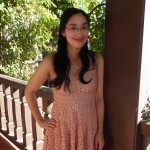 Hope you’ll like it, Elizabeth! 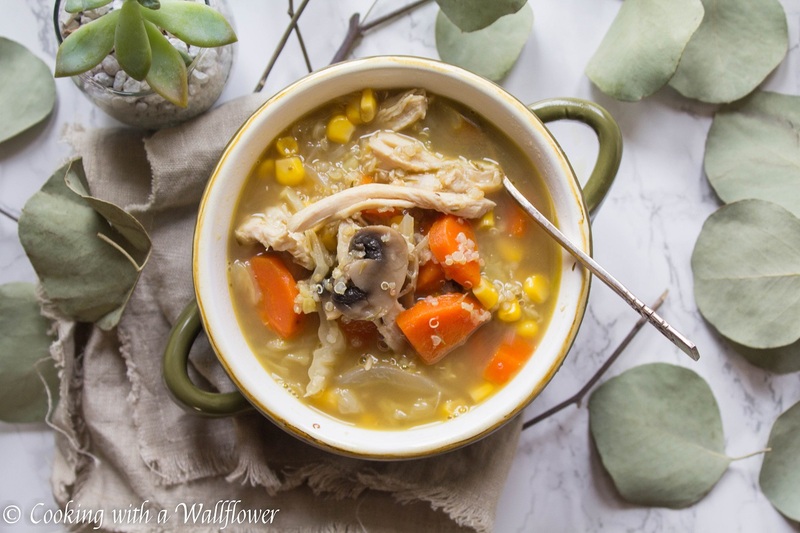 Thank you for sharing this wonderful recipe Andrea. Here in Mauritius we are enjoying the peak of the summer season but I will love to have a bowl of your chicken soup. A soup is refreshing in every season.